For the new year we will be hosting our Winter Kart Series at a new venue. 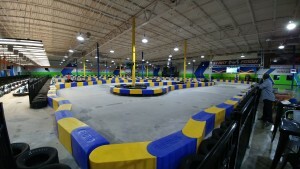 The Speed Club Center is a new electric go-kart venue in Newport News, VA. It opened around the summer of 2016 and has been gaining popularity in the area where the nearest karting experience was a good 30 minute drive. Tidewater Sports Car Club has blended mix of members across the Tidewater area. We created a heat map to show the concentration of members in the area and saw that while a good amount of members live in Virginia Beach and Chesapeake, there are also a good amount of people near the peninsula to make this a great event. This is also a great opportunity for our club to expand our membership to people who would otherwise never know about our club. Especially our local service men and women who are working and living near Langley Air Force Base, NASA, Naval Shipyard, and Yorktown Naval Weapon Station. The Speed Club Center will be managing the series for us. We will be using one of their league formats during our series. If we have more than 10 competitors they will split us into tiers of 10 for qualifying. To keep things interesting we will change the format every week including an inverted main race based on the previous weeks finishing order. If you’re interested in coming out and joining us there are few things that we ask that you do to make this a smooth event for all of us. Pre-register at Speed Club Center’s website if you do not have an account. Arrive on time, we ask that you arrive at 6:30pm. Race starts at 7pm, late shows will not be able to participate. As we have done in the past, this event will be held every Wednesday starting on January 18th. Cost for the event is $40 and it includes 3 races in their heated indoor facility. As usual, we hope to see you there. Contact us if you have any questions.